We did a half day tour to see the Peterhof Palace. However, I think the place deserves the full day… there is so much to see and admire. 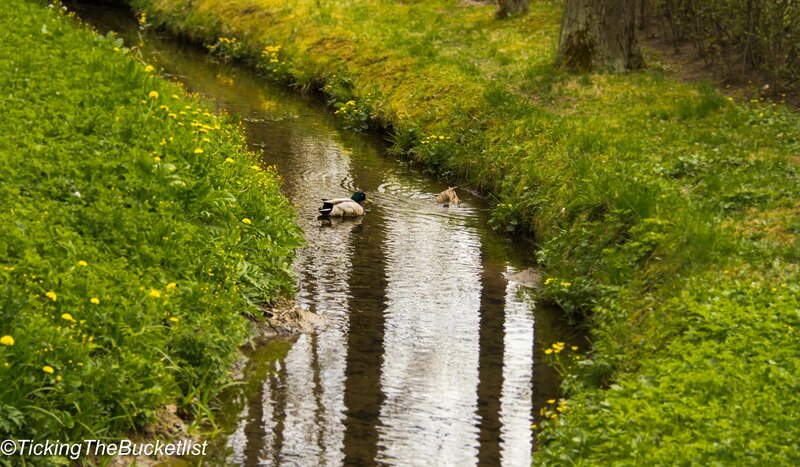 I would have been happy to have a picnic basket and enjoy a picnic lunch amongst the trees, with ducks waddling by! The Peterhof Palace is at a distance of about 35 km from the city centre of Saint Petersburg. You can get to the palace by train, by bus or by hydrofoil. The train from Baltiskiy Station to Noviy Peterhof takes about 45 min and is the ideal option if you want to travel by train. The station is about 20 minutes’ walk from the gates to the Upper Garden across Proletarskiy Park. Also, there are several buses which is a cheaper option but takes much longer. The hyrofoil is the best and recommended option. The journey commences at the embankment near the Hermitage Museum and ends at the pier close to the Peterhof Palace. You can then walk through the beautiful gardens to get to the palace building. The hydrofoil also makes sure that you do not face any city traffic and reach pretty much in the expected time. 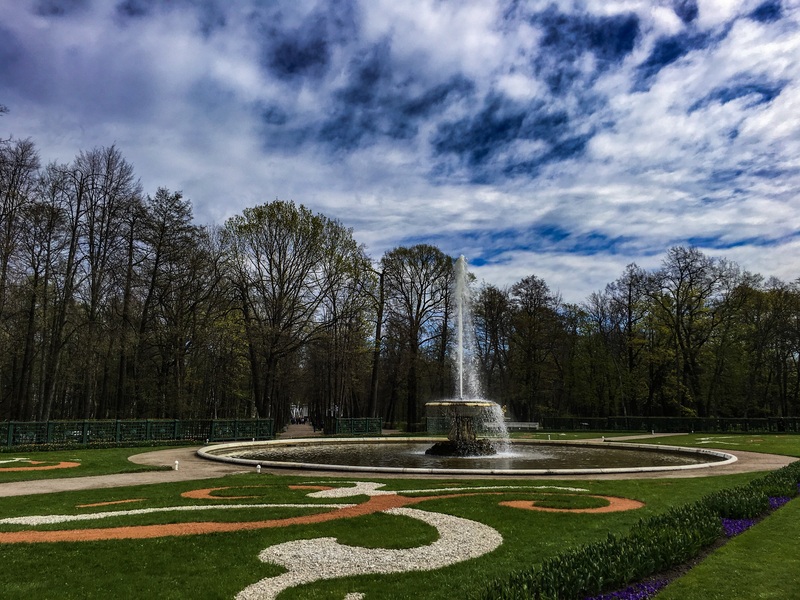 The Peterhof Palace gardens are open on all days of the week, from 9 am to 8 pm. The fountains typically operate from 10 am to 6 pm, and for an hour or so longer on weekends. However, the ornate Grand Palace, main Cathedral, chapels and private collections/museums are typically closed on Mondays. 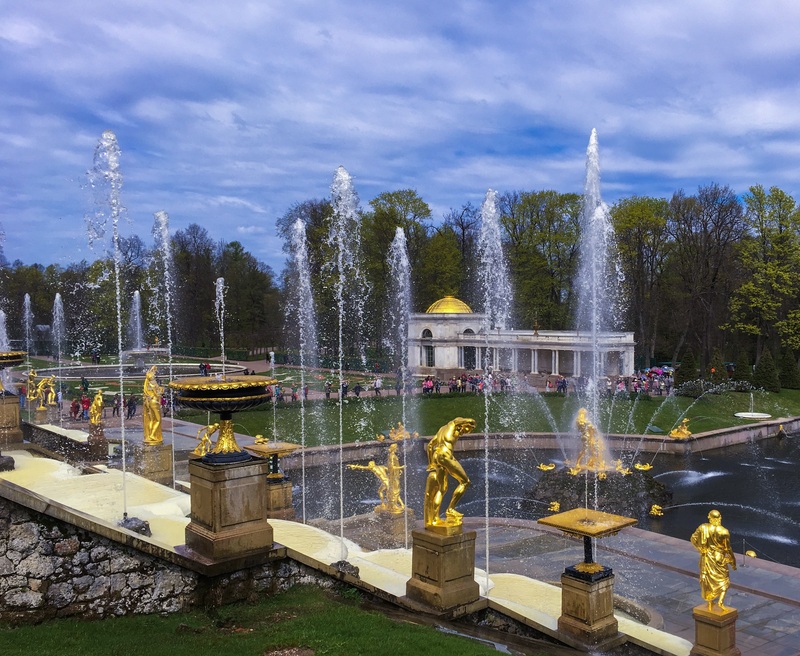 If you want to visit the Peterhof Palace to appreciate the gardens, fountains and buildings only from the outside, Monday is a great day as few people turn up. However, while the gardens and the palace are open throughout the year, the ideal months to visit them are spring and summer months. It is during these months that the fountains spring into operation and make the premises look grand. Try being at the palace 10 minutes before the fountains start in the morning… they start one after another, with some fancy music… an interesting show. 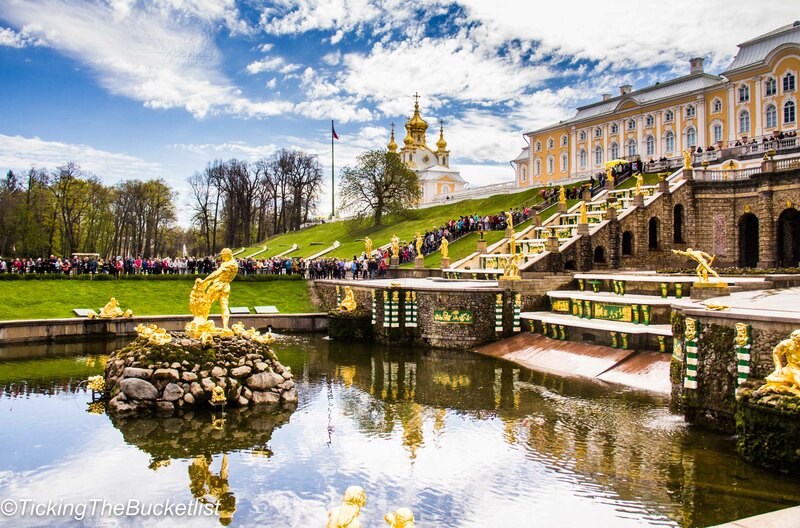 The tickets to the Peterhof Palace can be bought online. Tickets to the Lower Park cost Rub 750 if booked online. This ticket will not let you enter any of the buildings or see any of the collections. However, it is ideal if you have little time and want to enjoy the exteriors, gardens and fountains. It is best to buy tickets online to avoid standing in queues, especially during the summer months. If you truly want to visit the Upper and Lower gardens, along with Grand Palace, main Cathedral and other buildings, I would recommend budgeting at least 6 – 8 hours. The typical half day tour does not do justice to this place, especially on a bright summer day when the tulips and daffodils are in bloom. Palace garden with its manicured lawns.. There are many tour companies that run half day guided tours from the city centre to the Peterhof Palace. These tours include transport from the city centre, entrance to the Lower Gardens (other buildings will cost you extra) and the services of an English speaking guide. I would personally recommend having a guide for this tour, especially if you are short on time. The guide will help you see the highlights of the complex. 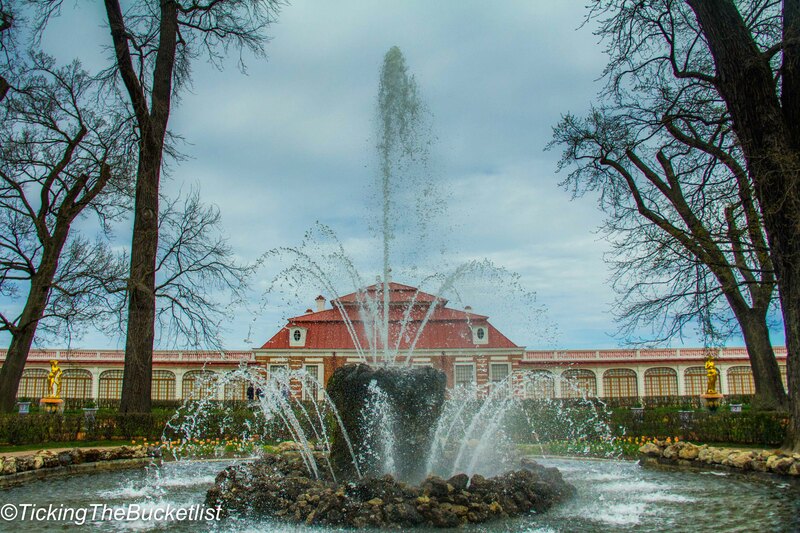 The Grand Palace and other building in the Peterhof premises can also be explored using audio guides, which is a great idea if you have time at hand. Exploring the garden requires a fair amount of walking. It would be best to wear comfortable walking shoes. Also, the palace is flanked by the Gulf of Finland and you may experience cold winds while you are there. It never hurts to carry a jacket while visiting the sea side at higher latitudes. There is a little cafe that serves snacks, close to the parking lot of the Peterhof Palace. However, it would be best to carry your own bottle of water and a small sandwich to snack on if you intend to walk around for a long time. There are plenty of benches in the woods and in the gardens and a picnic lunch is always a fun idea. I visited the Peterhof Palace in the last week of May, when the tulips had just started blooming. It was lovely… spring was setting in. The sky was blue, though the was still a nip in the air. I spent hours admiring the architectural and aesthetic beauty of the palace. The next time when I am in Russia, I would love to revisit the palace… this time, see all the buildings and the museums as well! 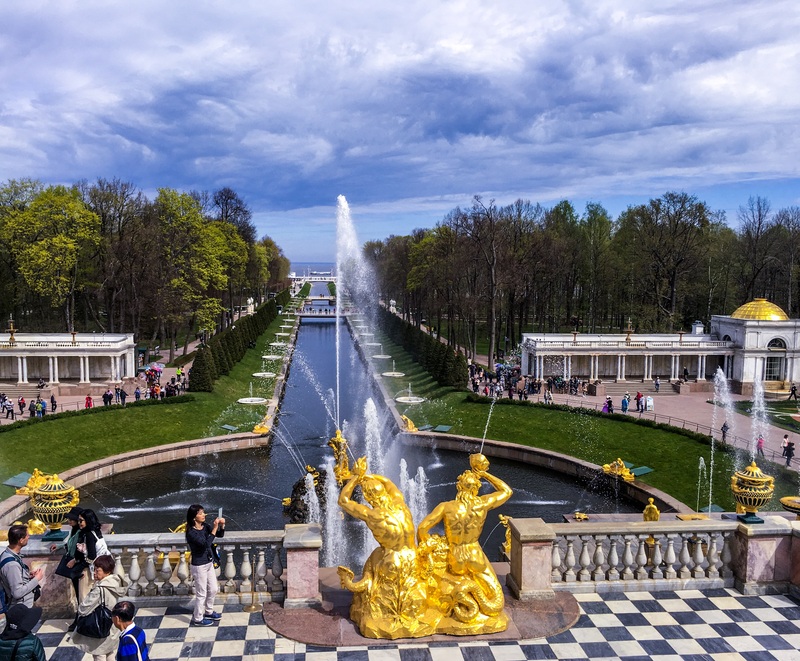 Get your share of ‘feeling royal’ by visiting the Peterhof Palace when you in Saint Petersburg and let me know what you have to say! What a beautiful place! I love all the gold details. I’d love to spend a few hours just wandering around. They should really think about putting in a proper restaurants with some authentic food there, they’d make a killing! Oh I’m showing this to my husband! I really want to visit Saint Petersburg and he is so afraid it’s such a cold destination! Yet I see so much green and even if the sky doesn’t look great… we can do it!!! Versailles seems to be an inspiration for many cities around the world. Peterhof Palace too looks grand! The musical fountain must be worth watching. I will time my visit there. Oh all those gold embellishments! What a beautiful place. It is a pity we didn’t get to see this when we were at St. Petersburg! I would love to visit Peterhof Palace some day. Everything about it looks so beautiful. Good to know it’s not too far from the city centre either. Cheers!! 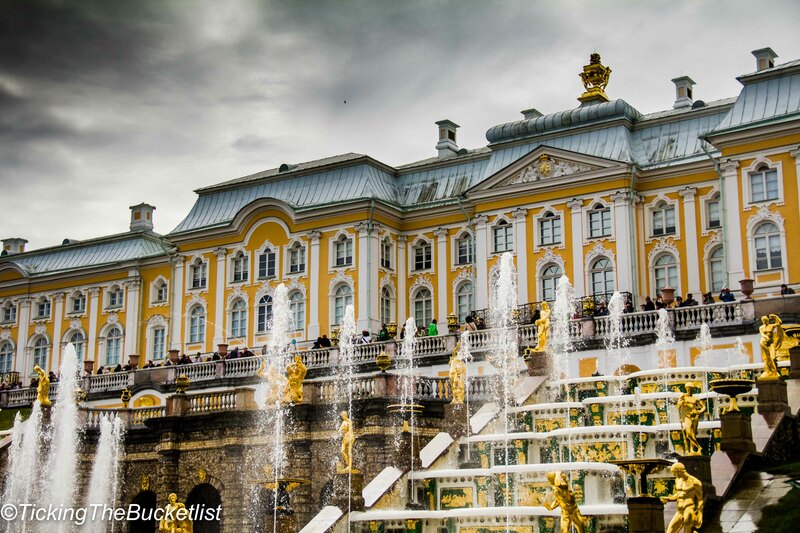 The Peterhof Palace is a stunning Palace, I love reflection photography so would be OK without the fountains on. I loved visiting the Palace of Versailles and can see it in this palace. I would say from your wonderful photos that the Peterhof Palace is a Russian version of the Versailles Palace. I would go by train from St Petersburg to see the palace. Wow, what a place! I can totally see the comparison to Versailles in those gardens. But those crowds! holy cow! It looks absolutely stunning. Peterhof Palace is grand and majestic. The location is perfect and the architecture is what makes me excited to visit this place. You have captured it well. Great tips also. Now I have a great reason to visit St Petersburg. First of All, I love hold everything and the photos you took sealed the deal for me. It does remind me a lot of the Palace of Versailles. Great article and thanks fot sharing. 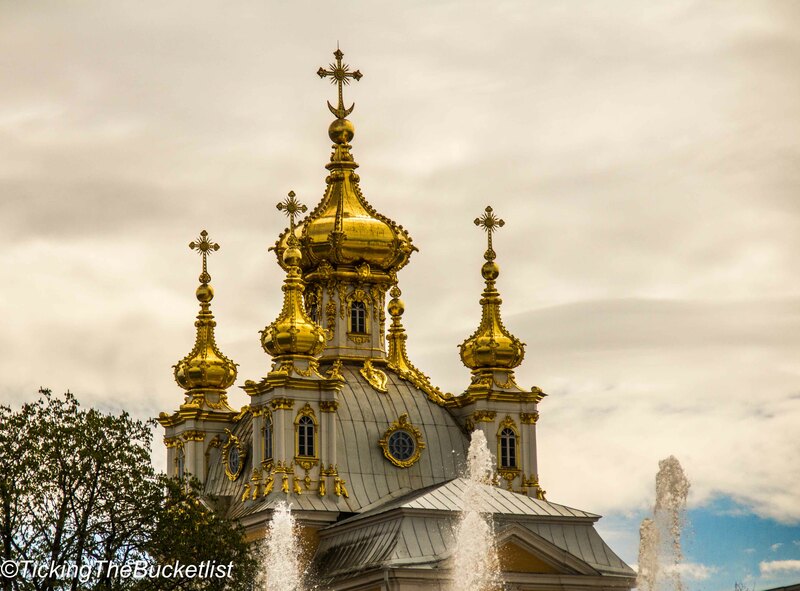 Peterhof Palace does sound like a must see if you go to St. Petersburg. This is a great guide to make sure you can maximize your visit to the Palace. I would need a day to photograph everything.